For the past 2 months, I’ve been wresting with one of the hardest questions I’ve ever wrestled with in my life. It’s kept me awake at night, plagued my mind as I go about my day, and driven me insane with my inability to answer. I’ve come up with different answers and none of them felt right, because there were so many answers. What is my favorite Killer’s album? Hot Fuss, Sam’s Town, Day & Age, Battle Born. (Sawdust is not being evaluated because I don’t think that’s fair.) Not only could I not pick a favorite, I couldn’t even pick a least favorite. Or a favorite two. Or anything. I really wanted to have an answer. Which one is truly the best? It’s not that I love them all so much that I can’t be critical. That’s not true at all. I can find at least one track on every album that I dislike, and I can criticize all of them to a surprising degree, but that’s because I criticize everything I love. However, I finally have an answer. I finally have a favorite Killers album. This means no less love to the other albums, however. Yesterday, I was pondering this question and also the question of which is my least favorite. My least favorite was originally Hot Fuss (which I know by many is perceived to be their best, but originally I didn’t like it as much, I just didn’t think songs other than Mr. Brightside and ATTID were catchy. My opinion has since changed). Then, once I had the chance to listen to all of them, I decided Day & Age was the weakest because it was so dance-y and less rock-and-roll. Then, I decided Battle Born was my least favorite because the songs were “boring”-ish and not fueled with the same drive as the previous albums (Until I gave it a re-listen all the way through, and now I completely take that back!). So, here’s my favorite album: SAM’S TOWN. This album was the first Killer’s album I ever owned, the first Killer’s song I ever heard (When You Were Young) is on it, and I adore (almost) every track. And its the only one that I never considered to be my “least favorite”. 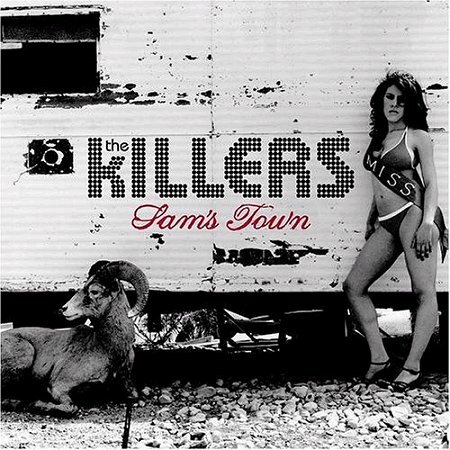 This album is so interesting because it got terrible reviews when it first came out because it is so different from Hot Fuss, now, years later, it is considered one of the most underrated albums ever. Why do you waste my time? Maybe its just me, but I feel as though this album radiates my life. I can connect with so many lyrics, I feel its so desert-y, so Vegas, so American, and I love the way Brandon uses his voice in this album. Its much different than Hot Fuss, because its better. That’s only a part of this song’s greatness. It’s one of my favorite Killer’s songs, go listen to it! This album is beautiful because it is a journey. And it’s not necessary one with a happy ending… or maybe it is because you’re listening to Killers music so it makes you happy. Other favorites from this album: When You Were Young (duh), Read My Mind, Bones, My List, For Reason Unknown. So pretty much, all of them. My least favorite song on this album is “Uncle Johnny”- its not bad, but I find that I usually skip it. The stars are blazing like rebel diamonds cut out from the sky… when you Read My Mind.